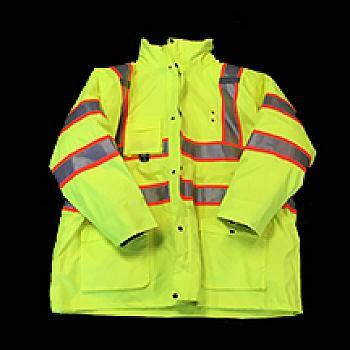 Water-Resistant Safety Coats and Other Gear From D.E. Gemmill Inc.
Large inventory: Whether you need only a Traffic Guru 6-in-1 coat or a wide variety of safety gear, pavement markers, pavement maintenance products, signs and more, you’re sure to find the right equipment in our wide range of available products. We’re the one-stop shop for all of your traffic control and pavement marking needs. Affordable options: We strive to bring you the best in safety gear at a price that fits within your budget. To make your shopping even more cost-effective, you can sign up for a first-purchase coupon. Customizable items: To find out whether a specific product is customizable, just call us at (866) 755-9794. Quick access: We make our products available online and in our retail store, and both options come with quick access. If you order online, you can rely on consistently fast shipping and delivery. If you decide to visit our store, you can try on the gear and leave with the right products the same day. Contact us right away with questions. Once you’re sure this Traffic Guru coat is perfect for your entire team, get yours here!